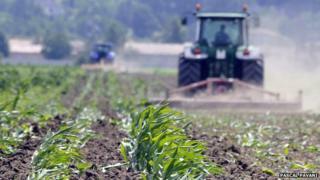 Europe's approval system for genetically modified (GM) crops is "fundamentally flawed", say MPs. The process assumes GM plants pose greater risks than conventional plants, which is not backed by scientific evidence, the parliamentary Science and Technology Committee report says. It calls for GM crops to be regulated on the basis of their characteristics not the method used to produce them. Opponents say GM may have an impact on wildlife and needs careful scrutiny. EU countries recently agreed to give individual nations more power to decide whether or not to allow GM crops to be grown on their territory. But the committee said there was a need for more radical reform to meet the challenge of feeding a growing population, using fewer resources, under a changing climate. In their report, Advanced genetic techniques for crop improvement: regulation, risk and precaution, MPs say agricultural innovations could be hindered, or even halted, by inappropriate regulation. The committee's chairman, Andrew Miller, said: "Opposition to genetically modified crops in many European countries is based on values and politics, not science. "This has driven research activity out of the EU and put at risk the UK's ability to be a global player in advancing agricultural technology." But organic food and farming group the Soil Association said research had shown that GM crops could have a negative impact on wildlife. Policy director Peter Melchett said: "In our evidence to the committee, the Soil Association reminded them that the UK government had spent millions of pounds of public money over five years, researching whether GM crops would be beneficial or damaging for British wildlife. And Liz O'Neill, director of campaign group GM Freeze, said: "The committee is keen to focus on the traits created by genetic modification rather than the process itself, but fails to recognise that the crops waiting in line for approval in the EU all share the GM traits that are associated with declining wildlife and flourishing super-weeds in the USA. "You can't currently separate the two, and even if you could, genetic modification is not 'cut and paste' with DNA. "There is much that can go wrong, so it is entirely appropriate that crops produced by this complex process should be carefully scrutinised before being released into our environment and on to our plates." Malnourishment is not just a lack of calories. It can also be caused by not having enough vitamins. Scientists are now developing bio-fortified foods such as Golden Rice, which has been genetically engineered to contain Vitamin A. Political leaders in Scotland, Wales and Northern Ireland have stated their opposition to growing GM crops. But ministers in England have pushed for the UK to make its own decisions. Farming Minister George Eustice said there was a need to have a "grown-up conversation" about GM. "We should have a science-based approach to these things," he told the National Farmers' Union conference in Birmingham. "We should be growing these crops, and we shouldn't allow non-scientific arguments to muddy the debate." For some EU nations, GM foods are seen as a threat to the reputation of their agricultural produce, while in others, ministers argue it is an essential technology to feed a growing world population. Responding to the publication of the report, Prof Paul Nurse, president of the Royal Society, said the debate on GM was too often "hampered by myths and misinformation". "That is as true of the debate among legislators as it is of public debate," he said. "To have a good discussion, people need to be able to assess the actual evidence, free of the ideology. The select committee is right that it is time for that discussion to happen." GM crops: What do the new rules mean?